This politically incorrect (some might even say “disgusting”) puzzle comes to you from an anonymous source, known only to Rockefeller alum (1977) George Barany, who is currently on the faculty of the University of Minnesota-Twin Cities. For more about this specific puzzle, including a link to its answer, visit here and here. More Barany and Friends puzzles can be found . 27. 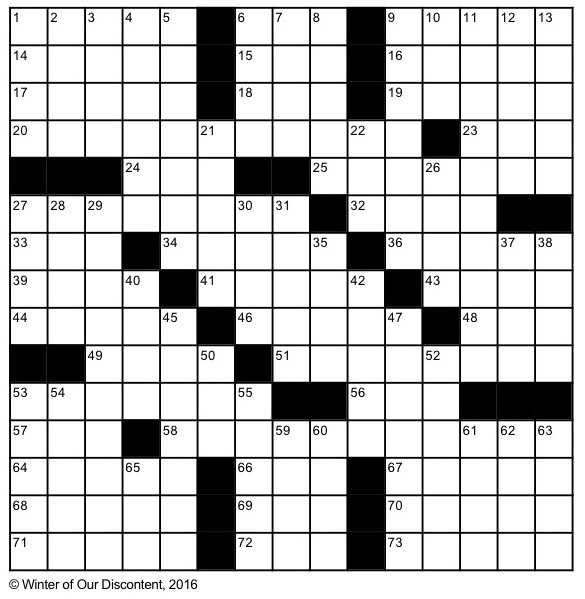 58-Across inveighing against the IRS? 57. LBJ’s palindromic “War on Poverty” agcy. 69. Try to become President, e.g. 2. State where, in 2016, armed militants dubbed Y’all Qaeda and Vanilla ISIS took over federal property: Abbr. 10. Great circle path, e.g. 26. “La donna è mobile,” e.g. This entry was posted in Current Articles, Miscellaneous by Juliette Wipf. Bookmark the permalink.